New research involving the removal and analysis of single neurons from fruit fly (Drosophila) embryos has revealed insights into the causes of mental diseases such as bipolar disease. The findings are published today, 11 October 2016, in Scientific Reports by a team of scientists from Plymouth University Peninsula Schools of Medicine and Dentistry and the School of Biological Sciences at Bangor University. 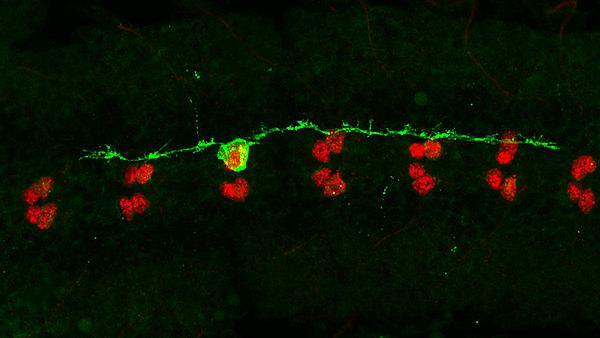 The research team removed single identified neurons from living fruit fly embryos in order to gain insight into the control mechanism for gene expression in developing networks of neurons. A neuron is a cell that processes and transmits information through electrical and chemical signals in the brain. One of the genes identified encodes an RNA processing protein called B52 – a loss of B52 increases the growth of axon branches, long slender parts of a neuron that conduct electrical impulses. B52 is also important to the synthesis of acetylcholine, a very small molecule which acts as a messenger between neurons. The construction of the brains in human and flies are very similar and 70 per cent of all genes expressed in fruit fly brains can also be found in human brains. Nowadays fruit flies are used to study the molecular causes of complicated human behaviour problems such as anxiety, aggression, alcohol and drug addiction. The human counterpart of the fly B52 is called SRSF5. Imbalances in SRSF5 and acetylcholine production have been found in the brains of patients with bipolar disease, indicating that a link between B52 and acetylcholine may also exist in human brains and that the disruption of the link may cause severe mental problems. This study shows for the first time that investigations of the fruit fly brain may lead to a better understanding of the origins of complicated mental problems in humans. By increasing the understanding of such causes it is hoped that drug therapies may be developed to mitigate or halt the progression of mental diseases such as bipolar disease. The study was led by Dr Torsten Bossing, Senior Research Fellow in Neurobiology at the School of Biomedical and Healthcare Sciences, Plymouth University Peninsula Schools of Medicine and Dentistry.